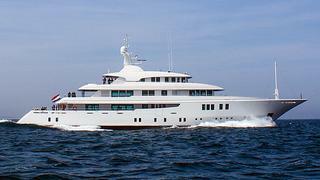 Thom Conboy at Merle Wood & Associates gives me the good news that his joint listing with Burgess, Icon’s 62.5m motor yacht Maidelle is sold. Built for an experienced owner in 2012, her exterior styling is by Redman Whiteley Dixon Design with a tasteful interior design from Cristiano Gatto. A key factor in the layout was the owner’s desire to create large entertainment areas, both formal and informal, to share with his guests, and also reflects his need to allow himself spacious room for family privacy. Lloyd’s registered and MCA compliant, Maidelle is decorated with a special range of woods, including mahogany, rosewood, ebony and walnut canaletto, all with a gloss finish. Maidelle was asking €55 million.